Whatever it is you’re doing in your backyard with your Slip-N-Slide/ kiddie pool combo, it’s a pretty sure bet that it’s not even half as cool as what they’re doing in this video. 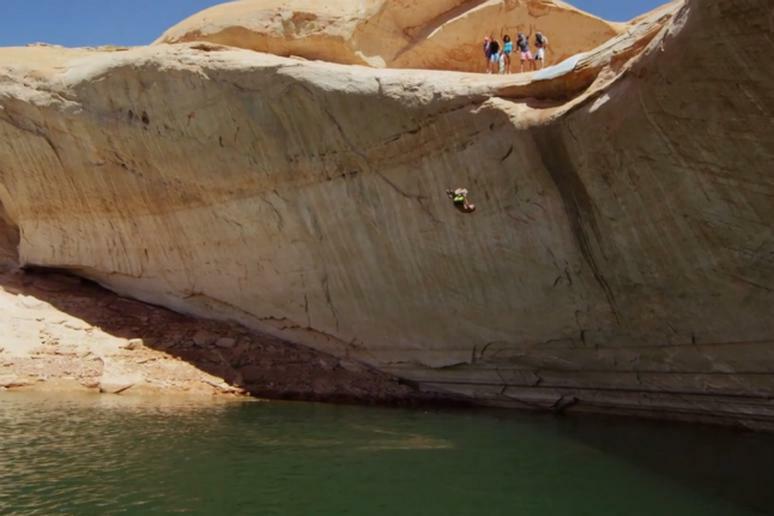 We’re not sure if it’s the music, the perfectly interspersed slow-mo sequences or the fact that those guys doing backflips were roughly two inches from permanent brain damage courtesy of the tip of that cliff—but it’s awesome. Then again it could just be the simple fact that they’re sliding off a ledge and flying 50 feet in the air to the water below. We should say that they are trained professionals, supervised by other trained professionals and that you definitely shouldn’t go out and try this on your own. But if you’re “just curious” (like we were), the description says they filmed in a southern area of Lake Powell, near Padre Bay, which is in Utah. While our official position is that you shouldn’t try this on your own—hypothetically, would you?